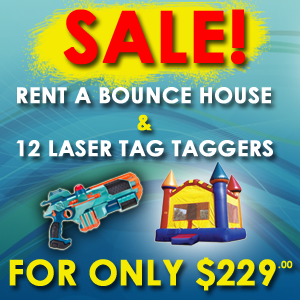 Save $80 by adding twelve (12) laser taggers to any Bounce House order. 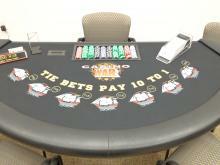 Packages come with everything you need including professional dealers and start at only $500. Call 440-822-3960 for details! You can rent 12 taggers for $149 picked up, and additional taggers at $10 each. Why Laser Quest when you can bring the laser tag experience to your own location for a FULL DAY for a fraction of the cost? Check out our Laser Tag Rentals today! Serving all of Cuyahoga, Geauga and Lake Counties. Including: Bainbridge, *Bay Village, Beachwood, Bedford, *Berea, Brecksville, *Broadview Heights, Brooklyn, Chagrin Falls, *Chardon, Cleveland, Cleveland Heights, *Concord, Eastlake, Euclid, Independence, *Kirtland, Lakewood, Lyndhurst, Maple Heights, Mayfield Heights, *Mentor, *North Olmsted, Parma, *Middleburg Heights, North Olmsted, Pepper Pike, Richmond Heights, *Rocky River, Shaker, Solon, South Euclid, *Strongsville, *Westlake, Wickliffe, Willoughby, Willowick, University Heights, Willoughby, and more! * additional mileage/delivery fees may apply. ©2013-2019 Cleveland Bounce, 27100 Richmond Road, suite 4, Solon Ohio 44139. Office/Fax: 440-822-3960. Powered by mightylittlewebsites.com.